Dissolving the Ego, Realizing the Self. Contemplations from the Teachings of David R. Hawkins, M.D., Ph.D.
3. Zitate aus Dissolving the Ego, Realizing the Self. Contemplations from the Teachings of David R. Hawkins, M.D., Ph.D. This collection contains inspiring passages from Dr. David R. Hawkins’s work. The reader is reminded of the illusory nature of the ego, along with the direct pathways to transcend its trappings. It is a reliable companion on the aspirant’s quest toward higher truth, traversing the spiritual landscape to move beyond suffering to experience the peace and love of God, to transcend illusion and realize the state of enlightenment. 1. Nature of the "Ego"
Zitate aus Dissolving the Ego, Realizing the Self. 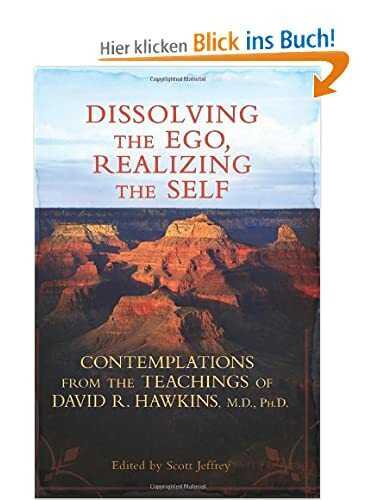 Contemplations from the Teachings of David R. Hawkins, M.D., Ph.D.